It describes 9 Personality Prototypes Models. Although we have some part of the 9 Types, the system works by finding first, which one is more suited to our basic personality., and finding afterwarrds, our complex dynamic combinations allowing us to redirect its effects.The Enneagram is a symbol formed by three overlapped figures: a circle, an equilateral triangle and an hexagram with sides formed by arrows in both figures. The contact of the triangle and the hexagram with the circle spreads nine equidistant points forming a map. The Enneagram of personality as a synthesis of various wisdom traditions describes nine personalities placing them in each of the points of the diagram and establishes dynamic connections through the arrows. Initially the theoretical frame comes from mystic and religious traditions, while later it was nurtured by scientific psychological contributions. From a psychological point of view, the Enneagram of Personality is a prototypical type model. Each personality, called enneatype, constitutes a prototype configured by a constellation of character traits, attributes, behaviors, motivations, and social, affective and defensive styles supported by a psychodynamic approach. The first descriptions of the masters of eastern tradition find correlations between the Enneagram and the scientific psychology of western tradition. What is really new about this system is the conceptual organization in a geometrical diagram. This encouraged to enneagram several psychological theories making appear new geometrical figures (triangles, lines) overlapping the original diagram that contributed to nurture the description of prototypes and its internal dynamics. The features of each type have been extensively described and documented up to now. The Enneagram is defined as a tool of self knowledge and of self transformation. It is a powerful instrument that allows us to be aware of how we are, how we became what we are, and where to we can reorient what we have discovered. Its effectiveness is given by the use of the geometrical symbol as a dynamic map that helps to understand the biopsicospiritual history of a person and guides his/hers transformation. It works precisely as an activator of psychological antibodies. It allows a person to be aware of the constellation of stable patterns of character, responsible for the restricted and conditioned personality. It allows the recognition of the non activated potential. It is an excellent instrument to prevent symptoms. It is an excellent tool of spiritual and psychological growth. From the beginning it has been proposed as a detector of the compulsive dominant identification. The way starts with this identification, which is the starting point and not the ending point. The deep understanding of our own historical conditioning; of the eternal return to the point that diverts and limits us is the beginning of the work. In fact, nobody exhausts the dominant pattern and because of the psychic dynamic a person can find aspects of himself/herself in many other points of the diagram. Personality is commonly defined as a person's distinctive character, which manifests through particular patterns of thought, emotion, and behavior. It can also be seen as a set of coping strategies that a person adopts early on in order to survive in a world that does not meet all of his or her needs. 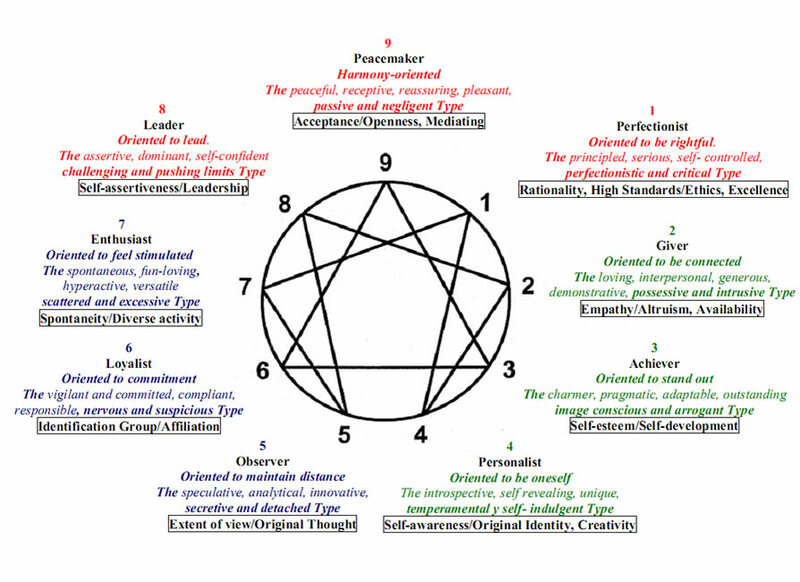 The Enneagram system of personality types describes nine distinct personality types and the relationships and interconnections between them. Each type is characterized by specific habits of attention. The awareness of one's type can lead to a great deal of insight about one's unconscious and automatic patterns of thinking, feeling, and behaving. Knowledge of the nine types can also inspire greater understanding of the differences between people with different and even conflicting worldviews. Understanding the underlying map of one's habitual tendencies can form the basis of personal growth and increased compassion for others. The three Centers of Intelligence also correspond to three core emotions that influence the character of the types. The head types (5, 6, and 7) are also the fear types, and their personality style is shaped by their relationship to fear. The heart types (2, 3, and 4) are also the grief or sadness types, and their personality style is fundamentally shaped by their relationship to grief. The body types (8, 9, and 1) are the anger types, and their personality is fundamentally shaped by their relationship to anger. The types on the inner triangle (3, 6, 9) are also called the core points of each center's triad of types. Thus, type 3 is the core of the Heart Center types; type 6 is the core of the Head Center types; and type 9 is the core of the Body Center types. Each Enneagram type may be influenced by the types on either side of it (adjacent to it). These two types are known as wings of the type, and may or may not color the expression of a given individual's personality type or core point. The circle of the Enneagram symbol suggests that the types or points exist on a spectrum, rather than as distinct types or points unrelated to those adjacent to them. Thus, an individual may be said to have a core point and one wing, two wings, or both wings that influence but do not change that person's core type. The lines with arrows between the types add further meaning to the information provided by the descriptions of the types. Some-times called the security and stress points, or points of integration and disintegration, these connected points also contribute to the expression of a given individual's personality. Thus, each person actually has five points that potentially contribute to the make-up of his or her personality: the core type, the two types that are connected by the two lines to the core type, and the two wings. Everyone needs to have some functionality in all three subtypes, of course, but one subtype usually dominates a personality, sometimes with a second nearly as well developed, and the third often markedly less developed. We might compare this common pattern of subtype development to a three-legged stool with legs of un-equal length so that the stool leans in one direction. Usually one leg will be distinctly shorter than the other two, and this would represent the person's least developed subtype. The One's attention goes to appreciating the excellence and elegance in anything such as a shape, musical score, a piece of art or a speech; to noticing and correcting errors; to identifying and adhering to standards of perfection in thought, feeling and behavior; to acting according to what is right or wrong; and to judging and criticizing oneself and others. The defensive coping strategy at the root of Type One's makeup is based on the internalization of a critical and judgmental parental voice. This voice is designed to call attention to and correct one's behavior before it becomes punishable. Major traits include a strong internal critic, a tendency to criticize or judge others, a concern with ethics and correct behavior, and the adherence to rules and standards. Ones also tend to be perfectionists and idealists. In terms of strengths, Ones are typically reliable, analytical, and moral. They often demonstrate integrity (consistent adherence to a set of values) and a desire to improve things for the good of all. Challenges for Ones include dealing with their own anger, managing their perfectionism, and being overly critical of self and others. As a heart-based type, the Two's attention goes to interpersonal relationships and paying attention to important people, to giving to others, and to gaining approval. The defensive coping strategy at the root of Type Two is based on giving and maintaining connections with important others in an effort to get one's own (often unconscious) needs met. Early in their lives, most Twos had the experience of not getting their needs met, especially their emotional needs. Major traits: Twos can be upbeat and cheerful, and they pride themselves on intuitively knowing what others need, often believing that they know what is best for others. However, this outward focus on others may mask a less confident inner self, Twos often have difficulty identifying their own needs or getting them met directly. Twos can be very empathic, friendly, and giving, and yet may become resentful if their generosity is not appreciated or reciprocated. Strengths: Twos often make friends easily, can be thoughtful, attentive and fun-loving, and they also tend to be competent and driven. Challenges: Twos often neglect their own needs, try to indirectly orchestrate the behavior of other people, and can be fearful of real intimacy with others. The Three's attention goes to setting goals and hitting their targets, to success and creating the "right" image in the eyes of others, and to doing rather than being. Type Three is the prototype of being identified with a persona. Thus, they often mistakenly believe that they are their facade. Although all the types do this to some degree, Type Three's character is formed around this mistaken identification with a desired image. The defensive coping strategy driving the Three is based on an early experience of being valued for what they did, not who they were. They perform and achieve in order to earn the approval and respect of others. Being preoccupied with doing, Threes can often be unaware of the fact that they numb themselves to their own emotions, because feelings can get in the way of doing and achieving. Major traits include an excessive focus on work and tasks, concern with image and the approval of others, and a competitive striving for status and recognition. Strengths: Threes can be industrious, energetic, and attractive. Challenges: They can be workaholics, unaware of their real feelings, and unable to slow down and simply be. The attention of Fours goes to what is missing and desired, to loss, to emotions, to drama, and to longing for the ideal and distant â€” thus, the sense that the heart is broken or damaged in some way. The defensive coping strategy centers around focusing on what is missing or lost as a way of avoiding feelings related to the hope for an idealized connection that may go unfulfilled. There is a focus on what is distant, special, and desired and an aversion to the ordinary, the mundane, and the everyday reality of what is. Major traits include a desire to feel special or unique, a concern with authenticity, a preoccupation with the search for the ideal forms of love or connection, and a wistful pleasure with melancholy. Unlike some other types, Fours tend to be comfortable with emotions and can be sensitive to the emotional tone of situations and relationships. Strengths: Fours can be emotionally strong, authentic, artistic, and sensitive. Challenges: Fours can be entitled, dramatic, dissatisfied in relationships, and depressed. The Five's attention goes to gathering knowledge and wisdom (akin to the symbol of the owl), to thinking and observing, to protecting inner resources and to warding off intrusions from the outside. Coping strategy: Typically, Fives were either neglected or intruded upon in early life, and so coped by withdrawing into themselves and creating boundaries to protect inner resources and prevent intrusive emotional and energetic demands. Major traits: Fives describe an inner experience of scarcity or lack, especially in terms of time and energy. They typically feel a strong need to hoard these resources and may become resentful when others threaten to impose on them, especially emotionally. Fives tend to be knowledgeable, emotionally detached, analytical, and objective observers. Strengths: Fives are often objective, calm in a crisis, knowledgeable, and analytical. Challenges: They may also be too emotionally detached, and their sense of inner lack often leads to withdrawing from others, creating excessive boundaries, and to the illusion that energy is limited and must be (over)protected. The attention of Sixes goes to questioning and doubting, to scanning their environment for signs of threat and danger, to searching for proof to confirm an inner sense of threat, and to creating worst-case scenarios. Coping strategy: Typically, Sixes grew up with authorities they believed were untrustworthy or unpredictable and felt they had to be watchful to survive. Consequently, Sixes have developed a keen ability to sense danger. There are two versions of Sixes: phobic and counter-phobic. Phobic Sixes are actively fearful, often withdrawing to feel safe, while still remaining vigilant. Counter-phobic Sixes may not be conscious of their fear (although it is still present), and instead automatically move to confront perceived threats or problems, as a way to prove that they are not fearful. In reality, both the phobic and counter-phobic reactions can be seen in most Sixes, although individual Sixes will tend to gravitate toward one end of the phobic versus counter-phobic continuum. Major traits: Most Sixes have a complex relationship to authority. They want authority figures to protect them, while simultaneously doubting the authority figure's willingness or ability to do so. They may also be fearful and anxious (phobic), or challenging and rebellious (counter-phobic). Sixes tend to suspect people's motives, and their concern with what can go wrong in situations can lead to procrastination. They can also be good troubleshooters and loyal supporters. Strengths: Sixes are often intuitive, loyal, analytical, and have the ability to challenge authority (counter-phobic) or see through false pretenses. Challenges: They may be overly suspicious or paranoid may project their own thoughts feelings and motives onto others, often have issues with trust, and may get stuck in self-doubt or excessive questioning. The Seven's attention goes to options and possibilities, to seeking pleasure, to avoiding pain and discomfort, and their minds typically shift quickly from idea to idea, akin to a monkey's arms moving from one tree branch to another in rapid succession. Sevens like to keep the mood upbeat, and so engage in elaborate future planning, playful interactions, and enjoyable activities. They typically have many interests and active imaginations. Coping strategy: The Seven coping strategy centers on avoiding fear and other negative experiences. They do this by reframing something fearful, negative or uncomfortable as something positive. They may also move toward the source of fear or discomfort in order to charm and hopefully disarm it. Major traits: Sevens can be fast-paced, fun loving, imaginative, and afraid of commitment. They often become enamored with their own associational thinking style, enjoy adventure and stimulation, and believe in keeping the mood positive and forward moving. Strengths: Sevens are usually adventurous, fun, positive, upbeat, and optimistic. Challenges: It can be difficult for many Sevens to make and keep commitments or deal with pain: They often believe the following: Why feel bad or suffer when there is the choice to be happy? Sevens also have difficulty staying focused or dealing with emotionally charged interactions. The Eight's attention goes to issues of power and control, to making things happen, to protecting the weak, and to fighting injustice. With an intense, authoritative, and sometimes explosive energy, they are usually ready to face any challenge. Coping strategy: As children, Eights often lived in combative environments where weakness was punished and they had to be strong to survive. As a result, Eights tend to lead with a strong and potent self-presentation and to hide or deny their own vulnerability. Major traits: Eights can be impulsive, excessive, dominant, and protective of others. They often move into action before thinking things through, express their anger more easily than the other types, and confront situations more readily than others. They seek the truth, but may confuse objective reality or truth with their own personal reality or beliefs. Strengths: Eights tend to be strong, powerful, commanding, energetic, and intense. Challenges: They can also have difficulty containing their own energy and anger, be controlling, and be unaware of their own vulnerabilities. The Nine's attention goes to connecting with others, maintaining harmony, peace, and comfort, and avoiding conflict. They typically enjoy the feeling of ease, harmony, and peace that they experience in nature. Coping strategy: Some Nines describe their childhood as one in which they felt overlooked or ignored and felt they had to go along with the wishes of others. Other Nines describe having had a pleasant childhood with almost no family conflict. In response to these environments, they learned to identify with others' positions, forget their own point of view, and go along to get along. As a result, while Nines can see many different points of view, they can have a hard time locating their own opinions, desires, or agendas. Major traits: Nines merge with others energetically, taking on the feel and positions of others, thus losing touch with their own internal experience and priorities. As one of the three anger types, Nines can be very out of contact with their own anger, which can leak out in the form of passive-aggression, stubbornness, and passive resistance. Typically they are more focused on others than on themselves. Strengths: Nines can be skilled mediators and loyal, steadfast partners and friends. They can also be warm, understanding and caring. Challenges: They can also have difficulty feeling and expressing anger, dealing with conflict, knowing what they want, and differentiating their experience from others in their lives.